Home » Temples and Ordinances » Are Mormon Temples an Extension of the Biblical Temple? ""Jesus replaced the Old Covenant, of which the biblical temple was a part .... A New Testament temple building is therefore a contradiction in terms, for it ignores the finished work of Christ, and harks back to the Old Covenant." What was the function and theological significance of this temple? How does it relate to New Testament faith in Jesus Christ? Are Latter-day Saint temples somehow an extension of the Biblical temple? This article offers a response to these questions based on Biblical teaching. The reader is encouraged to follow along with a Bible close at hand. Jesus’ words in John 4:20-23 (quoted above) underline three important points regarding the Old Testament temple and its relationship to New Testament faith: (1) The Jews were God’s elect people. Through them the Lord uniquely revealed His plan of redemption, of which the temple worship system (consisting of the tabernacle/temple, Aaronic priesthood, and sacrifices) was a central part. Though the Samaritans worshipped Jehovah (or Yahweh, as modern scholars believe it should be pronounced), the one true God, they rejected important parts of His scriptural revelation1 and Jesus here pronounces their worship false (v. 22). (2) The Biblical Scriptures stipulate only one temple2 (Deuteronomy 12:5ff; 14:23-24; 16:2ff; 26:2; Leviticus 17:8-9) — the Jews and Samaritans were divided over its proper location. It is clear that Jesus sided with the Jews in this dispute:3 He here specifically identifies Himself with the Jews ("we know what we worship ... "), and elsewhere He calls the Jerusalem temple "my Fathers house" (John 2:16). (3) Nevertheless, Jesus’ words in John 4:23 plainly signal the imminent end of worship at a temple building. As we will explore later in the article, Jesus instituted a New Covenant under which God does not dwell among His people through a temple building, but in His people through the Holy Spirit. The Jerusalem temple was preceded by a portable, prototype temple, or tabernacle. The tabernacle was built some time between the 15th and 13th centuries B.C.4 according to detailed plans divinely revealed to Moses at Mount Sinai (Exodus chapters 25-27, 30, 35-40). 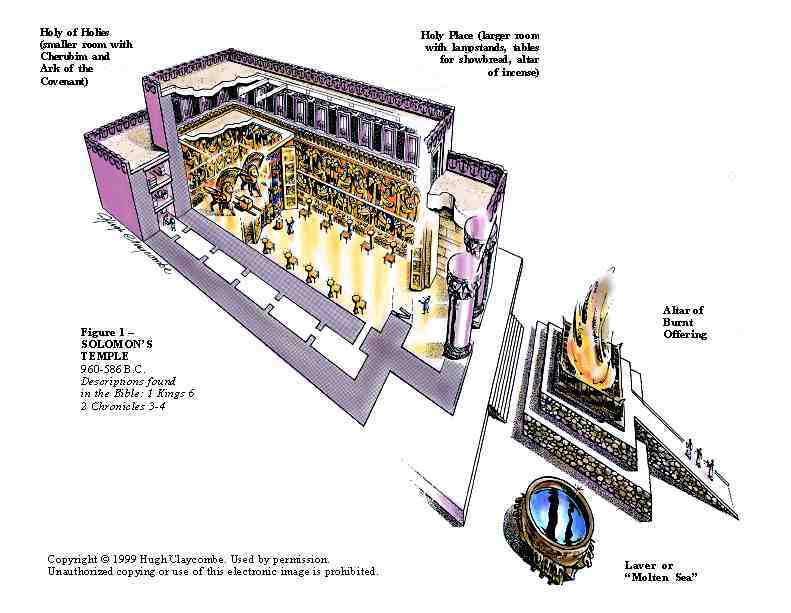 The temple worship system with its tabernacle/temple, Aaronic priesthood, and sacrifices is a major component of the Mosaic law commonly designated the "ceremonial law." Whereas the moral code of the Mosaic law (Ten Commandments) reflects the righteous character of God, and shows us our desperate spiritual need before a holy God5 ("by the law is the knowledge of sin" — Romans 3:20; see also 4:15; 5:13; 7:7); the ceremonial law demonstrates the redeeming love of God and His gracious provision of atonement, forgiveness and reconciliation. The animal sacrifices were the appointed means of atonement under the old covenant.7 Not any sacrifice was acceptable, but only the animal specified by the law, in most cases a male lamb. The person bringing the sacrifice placed his hand on the animal’s head as it was slain (Leviticus 1:4; 3:8,13; 4:15,29,33; 16:20-22). This signified the transfer of human sin to the substitute, which bore God’s judgment in the sinner’s place. These sacrifices foreshadowed the death of Christ, the "Lamb of God which taketh away the sin of the world" (John 1:29; Hebrews 10:10), and were provisional until His coming (Romans 3:25, Hebrews 9:15; 10:8-14. Gentiles were excluded from the temple grounds. Non-Jews were only allowed in a plaza that surrounded the temple, the so-called "Court of the Gentiles." (It was from this area that Jesus drove the merchants and moneychangers, as recorded in the Gospels).12 A low wall called the Soreg marked the boundary beyond which no Gentile could proceed on penalty of death.13 The exclusion of Gentiles illustrates the Jew’s special status under the old covenant as God’s chosen people. Atonement for sin is a prerequisite for true worship. The location of the altar of burnt offering immediately in front of the sole entrance to the sanctuary emphasized that God’s love and acceptance can only be extended to the sinner whose transgressions have been borne by His lamb of sacrifice. The primary function of the temple worship system was to teach the need for atonement of sin as a precondition for worshipping the true and living God. In the words of Solomon’s prayer of dedication for the Jerusalem temple: "who am I then, that I should build him an house, save only to burn sacrifices before him?" (2 Chronicles 2:6b). God’s provision for daily sanctification. Located between the altar and the sanctuary entrance was a large bronze basin, or laver. This was not used for baptisms, as the LDS Church teaches (baptism being a New Testament ordinance), but by the priests to wash themselves after offering sacrifices, and in preparation for ministry in the sanctuary (Exodus 30:18-20; 2 Chronicles 4:2-6). As thealtar speaks of justification (divine forgiveness that leads to eternal life), the laver speaks of God’s provision for sanctification (or daily cleansing) that enables forgiven but imperfect Christians to have fellowship with the Lord (John 13:10; 1 John 1:6-2:2). Only priests could enter the temple sanctuary. The sanctuary had two rooms: an outer chamber, called the "Holy Place," and separated from it by a thick curtain or veil, an inner room, the "Holy of Holies." Worshippers could enter neither; they came no further than the altar of burnt offering in the courtyard. Only the Aaronic priests entered the temple, where they ministered in the holy place on behalf of the people. Since non-priests are allowed to enter and participate in LDS temple activities, this is another point at which Mormon temple practice is at variance with Biblical revelation. While non-priests were not allowed to enter the temple proper (sanctuary), the priests’ activities there were public knowledge (see, for example, Exodus 30:7-10; Leviticus 4:5-7; 24:1-9).14 The LDS Church’s insistence on the secrecy of its temple ordinances stands in contrast to the detailed public knowledge of activities in the biblical temple. The inaccessibility of the Holy of Holies. This inner chamber, separated from the Holy Place by a thick curtain or veil, was the place of God’s special presence.15 Only the high priest could go behind the veil, and that but once a year on the Day of Atonement (Yom Kippur, Leviticus 16:2,34; Hebrews 9:7). Again, his activities there were not secret,16 for they are spelled out in detail in Leviticus 16:2-34. Why was the Holy of Holies inaccessible? The New Testament Epistle to the Hebrews provides an inspired commentary on the limitations of the old covenant’s man-made temple: "The Holy Ghost this signifying, that the way into the holiest of all was not yet made manifest, while as the first tabernacle was yet standing" (Hebrews 9:8). The temple worship system was a temporary provision in the divine economy. It foreshadowed the coming work of Christ, but could not truly accomplish the reconciliation of God and man (Hebrews 10:4). The thick temple veil and the daily repetition of the sacrifices were constant reminders of this fact. These limitations stand in marked contrast to the privileges of believers under the New Covenant. For through Christ’s completed work of redemption, the veil — indeed the entire temple worship system — has been rendered obsolete, and true believers are now invited to "come boldly unto the throne of grace" (Hebrews 4:14-16). The temple, its sacrifices and its priests "could not make the comers thereunto perfect," the Epistle to the Hebrews reminds us (10:1; see also vv. 2-18). They could not truly make sinful people fit for the presence of God, but were only provisional until the coming of the promised One — Jesus the Messiah — whose perfect and complete work of salvation they foreshadowed. During His earthly ministry, Jesus recognized the Jerusalem temple as the divinely ordained place of worship. He journeyed there for the feast of Tabernacles (John 7:10ff), taught in its courts (Mark 14:49), and exercised Messianic authority to restore proper decorum when He found the Court of the Gentiles abused by unruly merchants and moneychangers, calling the temple "my Father’s house" (John 2:16). Jesus is the High Priest of a superior priesthood. In contrast to the Aaronic priests who had to make atonement for their own sins, and who died and had to be replaced, Jesus is a sinless and eternal high priest (Hebrews 7:23,27). Jesus offered a vastly superior and truly efficacious sacrifice. The Old Testament sacrifices had to be repeated over and over, indicating that they could not truly atone for sin (Hebrews 9:9-10:4). By contrast, Jesus, the Lamb of God, offered His own blood, once-for-all. God forgave the sins of Old Testament believers prospectively on the basis of Christ’s shed blood, according to Romans 3:25 and Hebrews 9:15. Jesus ministers in a superior temple, the very sanctuary of heaven itself, of which the holy of holies in the Jerusalem temple was representative (Hebrews 9:11,24). However, in God’s redemptive plan the Jerusalem temple along with its priests and sacrifices became effectively obsolete forty years earlier when Jesus uttered His last words from the cross: "It is finished!" (John 19:30). For at the exact moment of Jesus’ death — so three of the four Gospels record — there occurred a most dramatic event: "the veil of the temple was rent in twain from the top to the bottom" (Matthew 27:51; also Mark 15:38; Luke 23:45). To fully appreciate the significance of this event we need to recall that the Gospel of John uses the imagery of the tabernacle to describe the Person of Jesus Christ: "the Word was made flesh and dwelt among us and we beheld his glory." The Greek word here translated "dwelt" (eskenosen) literally means "to tent, or tabernacle." In Jesus, the glory of God present behind the veil of the Old Testament temple, had now come veiled in human flesh; Hebrews 10:20 specifically calls Jesus’ body a veil ("the veil, that is to say, his flesh"). And recall that when Jesus was challenged to give a sign of His authority to cleanse the temple, he alluded to Himself as the true temple: "Destroy this temple, and in three days I will raise it up again ... But he spake of the temple of his body" (John 2:19,21). Thus, if in Jesus, God was tabernacling among us, and if his body was a veil, hiding from human view the full weight of divine glory, then Hisdeath was indeed the rending of that veil. According to rabbinic accounts, the thick temple veil was so strong that two teams of oxen pulling from opposite directions could not have torn it.19 Surely, this top-to-bottom tearing of the veil was a supernatural act of God, heaven’s response to the completed sacrifice of Christ, whereby those who respond in heartfelt faith are now granted free access into the very presence of God (Hebrews 4:16; 6:19;10:19-22). The New Testament describes the Christian church as the "body of Christ" (1 Corinthians 12:12-13; Romans 12:5; Ephesians 4:4; 5:30-32). This image teaches the remarkable truth that the risen, ascended Christ dwells in the community of true believers through the Holy Spirit, Who was poured out in a new and fuller way upon the completion of Christ’s saving work (John 7:39; Acts 1:8; 2:1ff). It is this community of true believers from various denominations who are a "spiritual temple" that replaces the temple building of the Old Testament. So it is that the apostle Paul reminds the Christians at Corinth, "Know ye not that ye are the temple of God, and that the Spirit of God dwelleth in you?" (1 Corinthians 3:16). Likewise, in 1 Timothy 3:15 Paul speaks of "the house of God, which is the church of the living God," and the apostle Peter describes individual Christians as a "living stones" whom God is building into "a spiritual house" (1 Peter 2:5). Here, surely, is the true temple without walls of New Testament faith. We began this article with three questions. First, we asked, "What was the function and theological significance of the Old Testament temple?" We have seen that it emphasized the need to approach a holy God on His terms and through the atonement of sins. Second, we asked, "How does the Old Testament temple relate to New Testament faith?" Here, we have seen that in the Person of Jesus, God tabernacled among us so that we could see His glory in a manner only dimly foreshadowed in the Old Testament tabernacle/temple. By His shed blood on the cross, Jesus satisfied the demands of God’s law on behalf of guilty sinners, as pictured in the Old Testament animal sacrifices. Based on Christ’s completed work, the Holy Spirit has been poured out on God’s people in a new way, so that the Christian church — all those who truly cling to Christ alone in heartfelt faith — is the "body of Christ," a spiritual temple in which God now dwells. The LDS Church operates many temples, whereas the divine revelation stipulates only one temple building. The Aaronic priesthood of Mormonism ignores the scriptural lineage requirements. Non-priests are allowed to enter Mormon temples, whereas only priests could enter the Biblical temple. Jesus replaced the Old Covenant, of which the biblical temple was a part. He established a New Covenant based on His once-for-all atoning sacrifice, and under which He now serves as the believer’s "great high priest" in the very sanctuary of heaven (Hebrews 4:14-16). A New Testament temple building is therefore a contradiction in terms, for it ignores the finished work of Christ, and harks back to the Old Covenant. 1. The origin of the Samaritan religion goes back to the rebellion of the ten northern tribes of Israel in the time of Solomon’s son, Rehoboam (1 Kings 12). The northern kingdom was subsequently known as Israel or Samaria, and the southern kingdom, ruled by the line of David, was known as Judah. Because Jerusalem and the temple were located in Judah, the king of Israel built two rival temples to keep his people from crossing into Judah to worship at the Jerusalem. Not surprisingly the Samaritans rejected all but the first five books of the Old Testament (Pentateuch), for the later Old Testament books are filled with references to Jerusalem as the place God has chosen to "put His name there," and also to God’s eternal covenant with David and his line as rightful rulers of Israel. 2. The Book of Mormon people are described as having multiple temples, in conflict with this stipulation of biblical revelation — for example, Alma 16:13; 23:2; 26:29. 3. The Old Testament is filled with explicit references to God choosing Jerusalem (Zion) as the place where "His name would dwell" in the temple: e.g., 1 Kings 8:44,48; 11:13,32,36; 14:21; 2 Kings 21:7; 23:27; 1 Chronicles 28:4; 2 Chronicles 6:6; 7:12,16; Psalm 78:68-69; Isaiah 18:7. 4. Some conservative Bible scholars date the exodus to the 15th century B.C., for example, Merrill F. Unger, Archaeology of the Old Testament (Grand Rapids: Zondervan, 1954), pp. 140-152. However most scholars, including many conservatives, date the exodus to the late 13th century B.C., for example, William Sanford LaSor, David Allan Hubbard, Frederic W. Bush, Old Testament Survey, 2nd ed. (Grand Rapids: Eerdmans, 1982,1996), pp. 59-60, and John Bright, A History of Israel, 3rd ed. (Philadephia: Westminster, 1972,1981), pp. 123-24. 5. In Matthew 5:21-28 , Jesus shows that the true demands of God’s law are not simply outward conformity, but an inner heart attitude. Thus, a heart attitude of hatred constitutes a violation of the sixth commandment (murder), and a heart attitude of lust is a violation of the seventh commandment (adultery). By this understanding, who can say that they perfectly keep God’s law? (2 Chronicles 6:36; Romans 3:19-20). 6. R. Laird Harris, ed., Theological Wordbook of the Old Testament, Vol. 1 (Chicago: Moody Press, 1980), "kapar," pp. 452-53. 7. As the New Testament Epistle to the Hebrews makes clear, the Old Testament animal sacrifices could not truly atone for sins (Hebrews 10:4), and were provisional only until the coming of Jesus Christ, whose death on the cross they foreshadowed (Hebrews 7:23-27; 9:6-10; 10:1-4). 8. The study, headed by Prof. Karl Skorecki of Rambam Medical Centre, Technion-Israel Institute in Haifa, Israel, "found clear differences in the frequency of Y-chromosome haplotypes between Jewish priests and their lay counterparts." This genetic commonality was found in those claiming priestly ancestry from both the Sephardic and the Ashkanazic communities. The Y chromosome is found only in men and is transmitted through the father. See "Y Chromosomes in Jewish Priests," in Nature, vol. 385, 2 January 1997, p. 32. 9. Although the name "Aaron" appears 48 time in the Book of Mormon, it is never used with reference to the Biblical Aaron or the Aaronic priesthood. Here are a list of other tabernacle/temple-related terms used in the Old Testament (with number of times used in parenthesis) that are not mentioned even once in the Book of Mormon: laver (13), incense (121), ark of the covenant (48), sons of Aaron (97), mercy seat (23), Day of Atonement (21), Feast of Tabernacles (17), Passover (59), house of the Lord (627). 10. The tabernacle had long been located in Shiloh, in the tribe of Ephraim. However, Jehovah Himself chose mount Zion in Jerusalem ("the city of David") in Judah as the place where He would "put His name." The election of Jerusalem is closely associated with God’s covenant with David, that his family line would always rule over God’s people. In the words of the Psalmist: "Moreover he refused the tabernacle of Joseph, and chose not the tribe of Ephraim: But he chose the tribe of Judah, the mount Zion which he loved ... He chose David also his servant" (Psalm 78:67-70). This again makes the point that biblical revelation appointed only one temple. 11. The wording of this sentence was adapted from article 4319 in the NIV edition of the Thompson Chain Reference Bible. 12. Matthew 21:12,13; Mark 11:15-17; John 2:14-17. 13. On one occasion the apostle Paul was mobbed by angry Jews who mistakenly believed he had brought a Gentile past this barrier (Acts 21:27-29). 14. The awareness and interest of the common people in the priests’ sanctuary ministry is illustrated in Luke 1:10. One of the the priests’ daily duties in the holy place was burning incense, symbolic of prayer (Psalm 141:2; Revelation 5:8; 8:4), on the altar of incense which stood immediately before the veil. The Bible records that as the priest Zacharias performed this duty, "the whole multitude of the people were praying without at the time of the incense" (Luke 1:10). Doubtless their prayer was that Zecharias’ service on their behalf would be found acceptable by God. 15. The Hebrew text of the Old Testament distinguishes between the transcendent presence of God (yashab), and his temporary dwelling (shakan) in the Old Testament temple. Solomon recognized this in his prayer of dedication for the temple when he said, "I have surely built thee an house to dwell (shakan) in ... " Later in the prayer he acknowledged that no earthly temple could ever serve as a residence for the transcendent presence of the infinite Creator of heaven and earth: "But will God indeed dwell (yashab) on the earth? behold, the heaven and heaven of heavens cannot contain thee; how much less this house that I have built thee" (1 Kings 8:12-27). 16. The Bible warns the Christian against participation in secret activities (Matthew 10:26,27; Ephesians 5:11,12), and Jesus affirmed that "I spake openly to the world ... in secret have I said nothing" (John 18:20). 17. Josephus, The Wars of the Jews, IV, 4-6. 18. Ridderbos observes that the centralization of worship at one temple facilitated the installation of the New Covenant when the temple was destroyed. See J. Ridderbos, Deuteronomy (Grand Rapids: Regency Reference Library/Zondervan, 1982), p. 152. 19. Cited by M. R. DeHaan, The Tabernacle (Grand Rapids:Eerdmans, 1955), p. 115. 20. The Book of Mormon itself describes Nephi as building a temple "after the manner of the temple of Solomon" (2 Nephi 5:16). 21. Click here for a study evaluating the scriptural basis for the Mormon practice of baptism for the dead. 22. In the words of Solomon’s prayer of dedication for the Jerusalem temple: "who am I then, that I should build him an house, save only to burn sacrifices before him?" (2 Chronicles 2:6b).